I'll keep you posted. So far, 12 hours or so in, they're doing quite well. Like the 6CA7 they impart a vintage like sound. They have plenty of power for my needs. No real sonic detributes. I seem to recall some time ago that Ron thought the Ruby EL34 BHT had the same look and construction as the TAD 34B-STR. So I thought, a lot cheaper, though lacking whatever selection process TAD uses and I got the Rubys. I like them, but I would not call them rich per se. If they are the same now, thought you might want to check. Thanks Will. I'll keep them in mind for down the road. A lot of great choices. Of course I still really like the OEM Tung-Sols, wonder it the cryo'd version do anything better. P.S. Hope you are still enjoying the Mullards I sent you. You're probably right in that I didn't give enough time to burn in. Yes I do like those Mullards, and they did change in good ways with more burnin, mostly opening/tightening up mid-mids down to a warm, balanced detail, while smoothing and softening the hardish edges in the upper mids. When I first heard them I thought they showed a variation of many unbroken in power tubes actually....but more exaggerated in the imbalance of open/bright upper mids and too thick low mids-to-bass. I have not tried the Tungsol EL34s except cryo'd, but would not be surprised if the "softer" quality of "raw" tubes might not be a benefit to that particular tube. It is so articulate that the subtle cleaning up, clarifying, and extension cryo tends to do may be a little over-kill for my tastes with that particular tube...just speculating though! I have been exploring a few KT66/6L6 types but not as much as I would like...been caught by too many things that have kept me from being able to play with my system...hopefully this will change in the next weeks for the better...audio therapy is what I could use more of theses days...so I hear you on buying records! Well, ultimately the cryo'd Tung-Sol KT-66 are a better fit for my Mk III than the cryo'd TAD 6L6WGC-STR. I just can't not have that wide open midrange that the Tung-Sols bring, along with the forgiving top end. The TADs are quite good, but just not quite "involving" enough at this time in that machine. I'll put them back in at some point when more broken in. In the meantime I've put the cryo'd TAD 6L6WGC-STR in the Torii Mk II that I have in my Dad's system ast the moment. They are sounding very good there. The Mk II has a slight retro vibe to the sound in comparison to my Mk IIIs and these tubes and the ERRs both complement this well. In the opposite of what Jim quotes Steve as saying about 6L6 tubes, these have a ver upward tilt with a tight and focused bass. At least in their current status of a few hundred hours on them. I've had to dial the treble way back with the treble cut circuit, but doing so I have a very nicely balanced and dynamic presentation, well-suited for the classical music that gets spun in this system. And they are very robustly built, quite handsome tubes. I seem to have gone full circle, amp came with the KT66, then I put in RCA 6L6 black plates, now I have Svetlana EL34, the EL34 seem to have more crunch and warmer sound than the RCA and KT66. I'm having so much trouble trying to tone down my Klipsch RF7-II speakers, the horns are so overpowering, next step is to have the speaker crossovers modified by DeanG, this is my last resort. I'm don't think I would buy horn speakers again. Sensitivity of 101db is too high, can only play new and mint records, picks up everything. Anyone try TAD KT66 from Cryoset in their MK4 ? In my setup, the Torii MK4 works well with 88-89 db speakers. I rarely go above 10 out of 20 clicks on my volume control. with the Torii MK3 and his preference of the EL34 over KT66 tubes, I just had to tube roll and finally pit my NOS Philips Holland Metal Base EL34s against my NOS GEC Grayglass KT66 power tubes. Except for the output tubes, my audio chain ( and other tubes used) is still the same ( details at the end of this post). The EL34 is known as the Queen of Midrange tubes. It imparts a more seductive tone to the mids. This is the primary reason for my personal preference!!! It must be the Hazen Grid being activated. The KT66 is not veiled in any way but the EL34 just sounds much clearer. Again, the KT66 is not congested in any way but the EL34 expands the soundstage by quite a fair bit. Adele's live performance of "Set Fire to the Rain" gave me an even more immersive sonic experience. The KT66 has tighter and more pronounced bass. The KT66 has sweeter sounding highs. Stringed instruments sound much better using KT66 tubes. I listen more to music with vocals as opposed to instrumental music. There really is something magical about the (midrange of) metal based EL34s that makes me willing to sacrifice the better bass and treble of the KT66. Please note that the KT66 is not lacking in any way. It still ticks all the sonic boxes in an audiophile's checklist. For those who are not willing to spend any extra on getting a NOS Quad of Metal base EL34s ( currently about US$1 Grand a Quad), I have the following suggestion. But if you want to test the waters, then I suggest giving the metal base replicas a go ( currently at US$ 350 per Quad) . Like myself, you might actually prefer the metal base EL34s. In my audio chain, I am now 100% convinced that the NOS Metal base Philips Holland EL34 beats the crap out of the NOS GEC KT66 Grayglass tubes. After my initial experience with the EL34s described in the above post, I started to seriously think about changing the settings on my MK4. Previously, I (erroneously) thought that with the EL34s, there was a big sacrifice to be made to the low end Bass and high end Treble. What's interesting here is that with the KT66, the bass is nice and tight and impactful when the switch is turned "off". When the switch is turned "on", the bass becomes over boomy. The exact opposite happens with the EL34s. Weird but true!!! I simply turned "on" the Bass switch this time. The bass is now nice and tight with the EL34s and there is no longer such a pronounced difference between the two. With the EL34s in place, I also maxed out (clockwise) the Treble switch. The sound of stringed instruments also improved by a noticeable margin. With the Hazen Grid Mod activated, sonic clarity improved by quite a fair bit. The soundstage depth also improved and the main vocalist became more "3D" like and centered in the Phantom center channel. The EL34s add a special vocal "presence" to the midrange of the music. Vocals seem to be slightly forward now, which is what I favour coz' I also use this setup for movies. With the EL34s in place, I simply fell in love with my Torii MK4 all over again. The other members of my family also asked me what I did to my system to improve it by such a wide margin. This is my personal litmus test for tube-rolling because they are independent casual listeners. In simple layman's terms, it just "sounds better". I'm happy for you. You've found your tubes of choice! My tubes of choice are the new production Genelax Gold Lion KT-66. Bass controls are different on both of my Mk IIs, and they work best with either. Bass controls on both my Mk IIs are very different than on the Mk IV, as is the treble control, so I'm not surprised that I have different results. Love these KT-66 and what they do to my system! In my system, I can't believe what I've been missing out for almost a year with the KT66 in place. If I had the MK3 like you, I'll also stick with it. With the right tubes in place, there is no reason for any further upgrades. Kudos to Steve for having the vision to include a tweakability factor to his line of Zen Torii amps. Offhand, I can't think of any other tube amp maker with such an option. In a positive way, these adjustment knobs help to mitigate the financial risk of trying out new expensive audio components. For example, someone who introduces a new bass heavy audio cable can still make a bass adjustment via the Zen Torii amp. Though noting which tubes we compare and like best, EL34 and KT66 are admittedly only part of what is being compared. As Lon and I have found comparing Tungsol KT66 to Genalex KT66, just like all those EL34s we have tried, different KT66 sound different. I am using Genalex KT66 in my MkIV right now and really liking their extended, slightly warm, rich, smooth and revealing balance, and all coming from a seductive "big" vibe. The MKIV bass switch works as expected with them. I can see how it could be nice with many EL34s since they tend toward a softer bass mid/bass, and enhanced upper mids in the MKIV. With the Genalex KT66, the switch also reduces midrange richness (as do the bass knobs on the MKIII in its own way), so I prefer to tune low bass with EQ in my software player. With the Genalex KT66 I am using (I think 60's) Miniwatt PCC88s, Mullard labeled OC2, Dumont labelled 40's OB3, and 50's RCA 5U4G-ST with top D getters. The sound is extreme in its natural, textured, clarified but musical (read "analog") beauty. Not quite like, say the Mullard reissue EL34, but maybe in between that and the Tungsol KT66, which by comparison sound really good, but are more open, leaner and more taught in my system/room than the Genalex. I only tried Tungsol KT66 briefly in my MKIII, where I had been using cryo'd Mullard EL34 reissues, and with that tube compliment the Tungsol KT 66 had really nice articulate bass and smooth highs, but were too open and tight in the mids for me. But I use open and textured 7DJ8/PCC88 a lot and this may well have been the over-the-top factor compared to Lon's favored 6N1Ps. Now the Gelalex KT66, hmmm, I bet I could tune those into the MKIII with rich mids while retaining brilliant micro detail. And from various explorations with the MKIV, I have been able to love Psvane 5881, Mullard reissue EL34, Russian 6P3S-E's, Tungsol KT66 and Genalex KT 66. But beyond the MKIV's inherent revealing, natural nature, and sweet musicality, and its excellent controls, I have a huge variety of tubes, and EQ, AND the CSP3 with different tubes, so I have a lot of fine tuning ability! With the DirectStrean burned in for the most part, I now have put the CSP2+ with Jupiter caps in between it and the Torii and I'm still using choice (I went through a lot of different ones!) 6N1Ps in that and have the added gain I was craving a bit in there with little or no loss of transparency. I'm going to experiment with 7308s in the CSP2+ as well, have some on the way. Sound is really really really good right now and I'm beginning to sink back into the sound and not be analytical once again, whew. Soon I'll put the Tung-Sol KT-66 back in and see how they stack up against the now seasoned Genalex; I've had so much burning in for too long, I want to just enjoy an untampered with system for a spell. Especially as caregiving has become even more complex and stressy of late. Sorry helping the folks has gotten more complex. I wish you all the best with that challenging work! After so long, I am amazed you switched out from 6N1P but from my experience with 7308, I can sort of see it. They are amazingly solid and complete tubes for the most part. I have some in my CSP3 for the power tubes and really like them a lot. They look the same as Amperex PQs, but are green globes, and called 6922. I had been using a 7308 in the input position for a long time, with 7DJ8s in the power, but the CSP is hard on 7DJ8s as far as I can tell, at least mine, and I love the green globes as power. Also kept going back and forth in the MKIII with 7DJ8s and 7308 as inputs, though usually being glad to get back to 7DJ8s. I did not have the Gold Lion KT66 in there though. I look forward to your thoughts on the Tungsol KT66 comparison. I have been contemplating getting some cryo'd Valve Art KT66, a different variation reissue of the GEC/Genalex of old. But my sound is so good the same tubes have stayed in my amp for something like 7 weeks since I put in the Gold Lions. I hear you on the burnin syndrome. My latest are Synergistic Research Red fuses ...wow, not a bad burnin and what a resoled but very smooth sound! I've read lots of good things about those fuses. I may try them out one day. I'm pretty happy with the FUrutechs I have in place though. Yes, the 7308 seem a lot different than the other types in that series and I've enjoyed their rich strength. No 6922, 6DJ8 or 7DJ8 have impressed me like this. (As you know the other tube complements have a lot of influence). Looking forward to seeing how they work in the CSP2+. . . .
Oh and also what has made putting the CSP2+ back into the chain possible is I found a used pair of the VooDoo Cable Ultralinear ICs so that I have those in the link both to and from the CSP2+. Ah. . .that's the ticket. Sounds good! What 7308s do you have? I have a pair of Amperex recommended by Mark in the Mk III and I have a Seimens and two unbranded ones on the way for the CSP2+. (Trying to go a budget route for now; will try using the 6N1P as the CSP2+ "power" tubes first). Anyone have experience with SEL Lorenz GZ32 rectifier tube? Only one person selling on ebay. Curious to know how they compare to other popular tubes used on the TORII MK3/MK4 and their true origin. Hi everyone, I want to share my experience with some recent VR tube rolling I have done. If you find that your Torii MK4 is still too "bright" or overly analytical, the following VR tubes will help to add more tube warmth. This is not at the expense of sonic transparency. I suggest replacing the default RCA VR tubes with European ones. I replaced my RCA 0A3 with the British made "CV3798"
Well LS, I've been looking at your post long enough. I pulled the trigger on the VR's tonight. Hoping these have the same warmth for the MK III as they do your IV. . The 75C1 pair are coming from Denmark so I won't get those until the end of the month. The British military CV3798's I ordered from Brent Jesse Recording so hopefully should see those before the weekend. Been wanting to get another pair of OC2's for awhile anyways since all I have are the 2 stock ones in the amp. The OA3's are a bit of a splurge because i've been pretty happy running OB3s but, I have been curious about the Brit tubes since you posted this so I gotta try them. Looking forward to hearing them. Give me some feed back on the performance of the Clear Day Double Shotgun cables with your speakers and amp. I have the Definitions MK 111 and have ordered the shotgun cables to be used with same amplifier. I replaced my (unbranded 14 ga) copper speaker cables with the Clearday double shotguns. Silver cables have higher resolution and transparency. They are not bright but the copper cables are warmer. The copper cables can't pick up microdetails and have less dynamics. M VR tubes were really virgin NOS covered with dust. The VR tubes need around 20 hrs of breakin before they open up. I went from "did I make a mistake??" to "OMG" after the breakin. Hope to hear from you again when you have received them. Good to know about the break in period. I'll definitely let you know the results. Dang, just got an email from brent jessee recording stating the CV3798's are out of stock . LS, would you mind posting a link for where you got yours? I got my vacuum tubes from Ebay. They might have more in stock. Hey Greg, I think I remember your having bass density issues? If so, it is very likely that changing from the OB3 to and OA3 varient will not only increase bass, but also push and density overall. Just a heads up, just in case.... I wonder what the British varient of OB3 is? So I had been going back and forth with the kt66's and the el34's with the ob3 vr's. Liked the mids with the 34's, bass and treble with the 66's. In the last month I was using the 66's and saw LS's report on the British oa3's and oc2's, specifically the warmth they brought and I realized that that was what I was missing. So I replaced the ob3's with the stock oa3's and I'll be damned, there was the warmth I wanted. And, the best part, the kt66's and oa3's play well together, like best friends. : . No bass density issues here. Really well rounded sound, rich, liquid and detailed. The bass is powerful and yet controlled and nuanced. I'm real pleased with the sound I'm getting now. That sounds great Greg. Yes, the KT66s I have have nice controlled bass. Interesting the OA3s are good there with them. Are yours the Russian straight bottle? Those seem the cleanest and most open sounding of all I have, so they push the power tubes harder but with less density. So I have about 30 hours on the Valvo 75C1's. I haven't done a real shootout with the OEM Raytheon's, just saw them on my step one day and popped them in. I think I can concur with your assessment. I haven't felt the need to fiddle with the treble cut with them in. Was listening to a CD from the early 90's, Vinx - Rooms in my fatha's house. I always thought it to be one of the best sounding recordings I have, and the music is amazing. I think I've never enjoyed it so much. So I went ahead and ordered a cryo'd pair of the tubes from a Spanish seller on eBay after he confirmed they were British Mullards. That will give me a playing pair and 2 back up pairs. Should be set for OC2's. Having an impossible time find any British CV3798's. At any rate, thanks for the tip. Glad to hear that you managed to locate some of those rare British VR tubes. I only managed to get mine from sporadic raids via EBAY. It still never ceases to amaze me when a couple of small glass bulbs can make such a big difference in improving the tone of a tube amp. i love that vinx album. a great unheard gem! well done! have we decided on a good KT 66 to go in this bad boy with the stock tubes? Thanks Roggae, yeah I haven't heard the other Vinx cd's, but this one my wife bought back int he 90's so I gotta credit her good taste. It is one sonic beauty. And this music is really grows on you. I have received my Torii a couple of weeks ago with the tubes that Steve advises and boy does this machine sound good. Out of curiosity, I'd like some advise on possible changes to the tubes to suit my musical preferences: I listen to dub from the 70's, roots reggae and late 70's early 80's funk and sometimes Rolling Stones, Dylan, Springsteen. There are so many nice ways to use tubes in the MKIV, what would you think about staying with what you now like for the 300-350 hours it will take to work through the bulk of burnin. It will likely take that long to stop burnin shifts and start to stabilize into what you can expect from the amp. This would give you chance to really get to know the amp in your system, and to make clear choices toward how you would like it change with tubes. All the tubes make a difference, and synergy is important...changing one tube or another can change the tonal balance and perhaps density, clarity, midrange warmth, detail, texture, articulation....lots of things. Can you identify which tubes Steve sent with yours? Probably Russian VRs and Ruby/Shuguang rectifiers??? And what are the power tubes and inputs? Have fun with your great new amp! I started this thread over 1 and a half years ago. Since then, my amp and speaker settings have changed. The purpose of this update is to explain some of my current tube choices and to highlight the 2nd stage of amp breakin that comes from owning this amp for over 1 year. (a) Bass tightening switch "on"
When I first bought the amp ( and even after a few hundred hours of initial burn-in), I had preferred to leave the positive feedback switch in the "off" position because the sound became too diffuse sounding. After another extended burn-in from normal usage ( I lost count!) which took over 1 year, the amp actually sounds much better with the positive feedback switch activated. The soundstage seems wider but the sonic images are now still focused. So for those who have just bought this wonderful amp and are still in the breakin process ( even after the initial few hundred), please continue to be patient. You will definitely get to this final stage of the burn-in process whereby every piece of music is natural sounding, makes you tap your foot in delight and pulls you into the music. The holy grail, IMHO, is the natural recreation of recorded music. Piano notes have a natural and extended decay. Bass is nice and tight. Cymbals have a natural shimmer. Stringed instruments such as violin strings have "air". With my current setup, for every piece of music that I listen to, I am instantly transported to the venue where the recording took place. All the ambient sounds are reproduced. This could be either an intimate jazz nightclub ( ala Barbara Streisand One "Night Only") or a Concert Hall ( ala Adele's Live concert at the Royal Albert Concert Hall) or even a cathedral ( with classical music). The natural ambience of the setting is just "there". Any piece of Yo Yo Ma's music could probably crack the heart of any Greek/Roman/Italian Stone statue out there. Here's my brief experience with the KT66 v. EL34 dilemma people sometimes wonder about. I think a lot of it depends on your speakers. I have Klipsch Heresy's, which are a sealed design. They have great tight bass all by themselves. When I pair them with the KT66, it choked the life out of the music I listened to. The music through the Klipsch Heresy's sounded anemic and I really felt that I had to supplement with a subwoofer. I recently switched to the new Mullard EL34 that Upscale sells. This was a revelation after listening to the KT66 for 5 months. The EL34 bass is loose and boomy, but with my Heresy's are just right. I keep the bass control switch off and my Heresy's sound great, WITHOUT A SUB. YMMV, but too much bass control can be a bad thing. Plus, now I get all of the benefits of the Hazen Grid Mod, which has been really fun to listen to as well. I really wish I would have done this sooner. tried many different input tubes but have been running Phillips 5r4gys rectifiers most of the time. Recently found a good testing pair of 1942/45 RCA 5u4g smooth plates and bought them, WOW! My first impression was more clarity yet a little mellower than the Phillips. The only downside was maybe a bit smaller soundstage. I swapped out some Amperex 7308's to some Siemens branded Tele 7dj8 inputs and everything came to life, amazing. The 7dj8 is a nice fit for the Torii. Very cool how much fun music and equipment can still be after 40 years of playing with it. Hey Paul, great to hear! Isn't it amazing what a rectifier will do in these machines? I recently popped a 'forties Philco 5Y3G into my CSP2+ and was really pleased with the change. A bit more dynamics, a bit more clarity. The older the better seems to be the rule I am finding with rectifiers! 'Forties RCA 5U4Gs that I used in my Torii Mk III for years were fantastic! Now I have 'Forties 5V4G in there. . . just works best with my tube complement. I've only had my Torii mkIV for only a few days now and am loving it already. This thread has been so interesting and helpful, thanks to all that have contributed to it. So far I'm using all of the tubes Steve sent with it except that I'm using a matched quad of RCA 6L6GC black plates instead of the EL34's. I've ordered NOS RCA 5u4 rectifiers, both NOS Mullard and Siemens input tubes and Genelex Gold Lion KT66 output tubes to play around with. Eventually I'll get some Holland metal base EL34's and GEC gray glass KT66's. By the time the Torii burns in I just find the tube compliment that suits me. Thanks again for all your input. Sounds fun Mac! Good thinking on waiting out the burnin while exploring the tubes you already have or are getting. Your amp will continue to develop for hundreds of hours in meaningful ways. Having a nice variety of tubes to ride through it will be really interesting along with the Torii settings. But also waiting for expensive rare tubes is well thought out I think. I really enjoyed the Tung Sol 6L6G coke bottle shape for a long time. Thanks will. It's because of you, LS, Lon and others that I came up with my tube rolling plan. While I'd be very happy with things the way they are.......as this amp is the real deal.....but rolling tubes is just too much fun. Thankfully I sought Steve's advice when building my dedicated listening room so that I don't have room acoustics to worry about, but I was cursing him while half way into building the quadratic diffusers.....over 1000 wood cuts!! !.....I'm praising him now though. Decwares power cords, interconnects and the zcd240 sure helped improve my system also. It's safe to say I'm a Decware fanatic now. Not quite 300 hours on my mkIV and its sounding so good it's hard to imagine it sounding any better, yet I trust everyone here and know it will. After putting in the Gold Lion KT66's for the last 150 hours I put the RCA 6L6GC black plates back in ......and they are staying in. Had I never heard the black plates I would have been very happy with the Gold Lions but that NOS magic shows up in spades in the black plates and there's no turning back for me now. My NOS rectifiers ( 60's RCA 5U4's) and input tubes ( Mullard and the Siemens that Steve recommended) will be here tomorrow......so more fun tube rolling is on the way. Mac, could you name the input tubes recommended by Steve with numbers and year of production. I have often thought about trying the RCA 6L6GC's and could have gotten them at a good price but only in pairs. Also I really like my RFT EL-34s too much. I've tried the Tung Sol KT-66 that came with the Torii MK IV and some Russian power tubes. I've focused mainly on tube rolling in the ZP3 and the CSP3 and input tubes in my Monoblocks. The Torii has had White Label Amperex 7308's almost from the beginning in the input positions...no rolling there. Mark. Mark, the tube Steve recommended is the Siemens PCC88/7DJ8. Not sure if those designations indicate the year they're from or not. I'm told they are very detailed with a gorgeous airy high end, silky vocals and tight bass. Steve mentioned getting long bottles but Andy at Vintage Tube Services had no idea what that was........and that's a first for him! I constantly floored by his knowledge of tubes and vintage gear. I also ordered a pair of Mullard input tubes, supposedly the antithesis of the Siemens. I want to see which input tube works best in my system. Output tube question. I'm told the RCA 6L6GC black plates should last about 20,000 hours in the Torii. That seems high. Many seem to replace theirs yearly. Will the tubes actually last 20,000 hours but lose their fidelity much sooner? Hey there. I've gone through 2 quads of the Gold Lion KT66s and 1 set of the KT77 GL only getting about 700-800 hours on each quad before they sound tired. Is this normal? Does anyone have other suggestions on something that might last longer and not be NOS expensive?? Just curious. THANKS! PS....can you use KT150s in the Torii MK4?? Mine always ate tubes pretty quickly. I settled on the KT77's as my favs. I wouldn't go NOS for output tubes. I doubt you'll get any additional mileage out of them. Looking for suggestions on a solid functional set of matched quads. Budget stuff please, no pricey NOS collector tubes with perfect original boxes. I see matched quads on ebay for as low as $50 for all 4. Are these all junk? Any of them solid and reliable? JJ? Valve Art? Sonically, I am pretty fixated on midrange at the expense of all else. I have a Mk III, not a IV, but they seem to use the same tubes. Especially if you like midrange. Then I do like KT66 . . . my favorite that I have tried of new production are the TAD (second favorite are Gold Lion, then JJ, least favorite I have tried are the Tung-Sol). I like cryo'd power tubes. Not only do I think there's some sonic advantage, the process that cryoset uses seems to weed out most duds. I like these in my ZMA. They can be found a little cheaper on ebay but not necessarily in matched quads. I think others use them in Torii III and IVs. Right, I mentioned them in my post above. Nice! Cheap! I should've clarified, I'm looking for EL34s. (It's a Blue Torii)..
Any preferences for EL34 matched quads? I have used KT66, KT77 and El34 in my Blue. I have not used the 6L6 types Lon and Archie are recommending in that torii, but have in my MKIII and MkIV. It might work fine in the Blue Torii too. If this tube interests you, ask Steve if someone else does not answer that one here. If you want to stay with the EL34 sound, and want to buy some burnt in, but not much more, I have a bunch of them I could sell inexpensively. PM if interested. New or used, if you told us the tube you are using, and how you would like to change the sound, we may be able to guide you in the right direction. i just bought a bunch of tubes recommended here. the 6l6's, some kt77s, and a few el 34s. I also bought some new rectifiers. Now i'm looking into input tubes but i've kind of busted the wallet for now. Anyone got any lying around they want to send to a brother?? I can send you a pair of those Chinese 6N1P type that some are talking about and up here. PM me your address if you wish. Hey guys. Thanks for the suggestions on the 6P3S-E from Cryoset. For the last couple years I've been using GL-KT77s but they seem to wear out fast (7-800 hours) and start sound dull but I really like their sound. After about 20-25 with the 6P3S I have to say I am pleasantly surprised, especially for the price compared to the KT77s. The mids sound great....although I think you lose a little on the top end but the bass is better than the KT77s....maybe a little more...but not flabby. Thanks again for the tip. They are very good tubes, and as you say a great value. Glad you are digging them Paul. Hey guys! i'm spending my evening ROLLING tubes. I'm starting off with the cryoset Sovtek 5ar4's. Right off the bat i feel like i'm getting more detail. I'm pairing them with my Gold Lion kt66's right now, but plan to roll in some other power tubes throughout the night. Any thoughts? Enjoy yourself! I hope you roll and find a great complement. I'm NOT rolling tubes. . . I love what I have in my Torii Mk III so much right now, it's dishing out everything just right! Just perfect for the "all around sound" I want for my collection with my sources and cabling and speakers. I'm so happy! Sounds fun. The KT66 Valve Arts look just like Lon's favored TAD KT66 to me. The companies may well have different screening methods...don't know the details, but I am guessing they are the same basic tube. Like the KT66 Gold Lion, it is another attempt at a remake of the famous early KT66s. I have posted here and there about the VAs as has Lon about the TADs, so I think if you search the Forum with those tube names you will get some ideas. There are also posts around on the Tungsol KT66. I suspect Steve still ships these with the the Mystery and MKIV (KT66 option). Without putting them in to double check, I recall that Tungsols are likely the cleanest, most open and linear of the new KT66, the Gold Lion probably the darkest/warmest, and the Valve Art sort of in between...each having their own personality (and being highly influenced by the rest of the tubes used). The 5AR4/GZ34 types are interesting. Compared to 5U4G-ST types, generally, they tend to be more dynamic, tighter bass, more clear and defined, more focused...doing this musically if they fit in with the rest....the combination likely coming off as more detailed and defined in your experiments. The Sovteks are attempts at old Mullards I think, and a pretty nice tube. If you get seduced further by it, you will pay much more, but also get more refinement in every aspect from NOS Phillips/Mullard types, expensive because they are so well liked. But there are deals that come up now and then, especially with off brand labels and/or if they are a little used. I use Phillips/Mullard GZ32 types, a very similar sound, but a bit less powerful than a GZ34, so tending to more open, less big/dynamic, less deep and dark, less obvious. Not better or worse, but a nice choice for fine-tuning if the general GZ tube qualities are what works, but GZ34 tend to be a little strong. I loved RCA 5U4G-STs for years, but finally this GZ32 type has become a standard here. There are a bunch of variations of that basic Euro type too, all sounding a little different....Then there are American designated 5V4Gs, pretty close equivalents, but having a discernible difference in feel from the GZ32s, and each of them also sounding different. I find these can be quite good in the right company too, and much less expensive in general, but not generally as sophisticated in balance and refinement to me. Also, in my system, they tend to be a little less linear...often (though not always) a bit more open on top, and a bit darker/denser below in the general balance. But if the balance of the Sovtek GZ34 works, the GZ32 or 5V4Gs could be too open/lean, and/or a little lacking in punch and power. Hey Will, after thinking the Amperex white label 7308 was my input tube of choice, I have changed my mind after purchasing three pairs of NOS 1962 USA Amperex White Label PQ 6922s. I think it's that they are a little less detailed or have a less prominent high end...a little more mellow? Also the Bass seems a bit more dynamic and punchy than the 7308s. They are now in both the Torii MK IV and the Zen Mono Blocks. Mark I wish I had information about those Amperex I could contribute. Will, I have actually today done what I undid a month or so ago: put the Sylvania bottle-type 5U4G back in the Torii that I had taken out to replace with my trusty RCA 5V4G rectifiers. I noticed this weekend that one channel was about 15 percent "weaker" in sound than the other and traced it to the rectifiers. Though I have another pair of RCA 5V4G to pop in I thought I'd give the Sylvanias another time to shine and they are doing so, I think those English 75C1 have given them a nice face lift. Really enjoying the sound: lots of texture and detail but no harshness. These Decware amps are like having a dozen amps in one! Hey Mark, I liked the early 60's white American PQs too last I checked. Different batches and all, but I think I recall them being quite similar, maybe a little cleaner, maybe and a bit less textural than normal American Amperex 7308s and 6922s, balanced a little toward bass, the combination changing the whole feel some...I felt like the detail was all there, but a little different balance and a little less "forceful" overall...subtler and refined. I am not home so can't double check. Does this sound right to you? I liked both for different reasons, but as has been my pattern, I rarely use 6922 types in the Torii... They tend to be just a little too clean and powerful there for me. I use them most of the time in the CSP3 though, especially in the power section. For a few years now, I seem to be caught by what appear to be early Siemens ECC88s (the ones I use most, late 50's/early 60's and labelled CBS and IEC/Mullard)...lower key than 6922/7308/E88CC/E188CC types, but nice extension and balance, neutral, mellow...with pretty rich fine detail character. This tube is variable also though. I have one pair labelled Siemens, and depending on the company it is with, it can get too bright/clean for me...more 6922-like in ways, with big bass and great power and articulation, and all this along with the ECC88 tendency toward inner spaciousness. Maybe Siemens kept "the best" for themselves, and I prefer the more complex character of the "2nd string"? I will check the link you posted later if we have internet access next campsite. EDIT: Mark, I checked your question about the 12AX7s, and sorry to say I have no real experience with that tube type. I agree Lon. I also find that 75C1 does wonders for refined friendliness without loss of fine detail and texture, creating even more Torii flexibility. I am using some late 40s Sylvania 5U4G-ST types in my MKIII at the moment, the ones with the wires running up between the plates...really refined and balanced/open tubes! I agree also, that with the flexibility of the Torii settings, and its many tube types, once we get used to it, the possibilities for great mixing and matching of various tubes toward different flavors of beauty are amazing. I'm not sure if I have the same style rectifiers but I'm enjoying their sound. The 75C1 are definitely a nice change and helping my tube complements. I also installed a new jumper of silver wire between upper and lower sets speaker connections (one leg) on the HR-1s which are helping create a very nice sound, and then today I finally got the 36/10 Duelund resistors to run on the other side and replaced the Mundorf Supremes with them. The resulting sound is wonderful if just a tad bass-shy--previous experience with the other pair of Duelunds leads me to believe that will come in time. The system now sounds like the best solid state I've ever heard WITH that fullness of note character that the best tubes bring. I'm hoping I can just leave things alone again. (How many times do I say that?) The Torii/HR-1 combo just keeps on revealing more and more ways to excellent sound. I hope they do for a few more decades! Well, I couldn't leave well enough alone. I was missing just a bit of bass and warmth and though the Duelund resisters may break in a bit more and deliver just that I put my other matched pair of old RCA 5V4G bottle type rectifiers in and there was that body that I was missing with attendant a bit of bass and warmth. So they'll stay in for these output tubes and when I switch out output tubes again I'll try the Sylvania 5U4 bottle-types--they may be perfect for the JJ6CA7. Interesting. I always really like the change-up from different rectifiers in the MKIV, but they tend not to last long. Back to GZ32 or 5V4Gs I go, being pretty ideal these days in my system/room. Even the 5V4Gs so far rarely last real long. I think part of why the Sylvania 5U4G-ST are still in the MKIII is that I use it mainly for background music for healing work, and with Hytron OC3 and Tesla PCC88, it is beautifully open, textured, spacious, and articulate at low levels. I need to try some 5V4G or GZ32 there. I'll try GZ32s one day. 5V4s just seem to hit the right marks for my system. I'm trying not to roll tubes. . . but with these machines it's almost impossible to resist! I can see why the RCA 5V4G-ST has been good for you. I can't use it in my setting, but can hear how it could be just right in the right setting. Since you tend to end up back with it after playing other great choices, it is clearly doing the right things there! Balance is balance! i'm starting to think it's the input tubes. i'm currently using the tubes my amp shipped with. what are some other suggestion you guys might have?? what i'm noticing is that currently i can hear the noise floor. is it possible to make that "white noise" go away? I think the inputs are probably a good place to look, but if it is in both channels, that seems possible, but is weird for tubes in my experience...for two to go at once. If it is mainly in one channel, you can switch tubes side to side, one by one, to find out. If the noise moves, that's your tube. I have had noisier rectifiers than others. If you have your original rectifiers, it could be good to trade them out with the sovteks just to see. When power tubes have gone on me, they start distorting first, but these are early failures...I personally don't know what happens with too much age. I roll tubes too much for that so far! Also, some power tubes are noisier than others. If you can't find it elsewhere, I would try the stock power tubes briefly too. I guess you have looked at your cables, made sure the signal cables are distant from and cross the power cables rather than running with them, and signal cables away from noisy things, like power supplies. If the noise is uniform, both channels, it could be a lot of things...Is it? As to replacing input tubes, that would depend on what you want your sound to do...how you would like it to change? For the bass tightening try some OB3 rather than input tubes is my suggestion, if you haven't yet. May not "tighten" per se but will change the presentation in that sort of direction. . . . I agree with Lon's OB3 suggestion. In my experience with Toriis, flabby bass can be in part too much of it for your space. 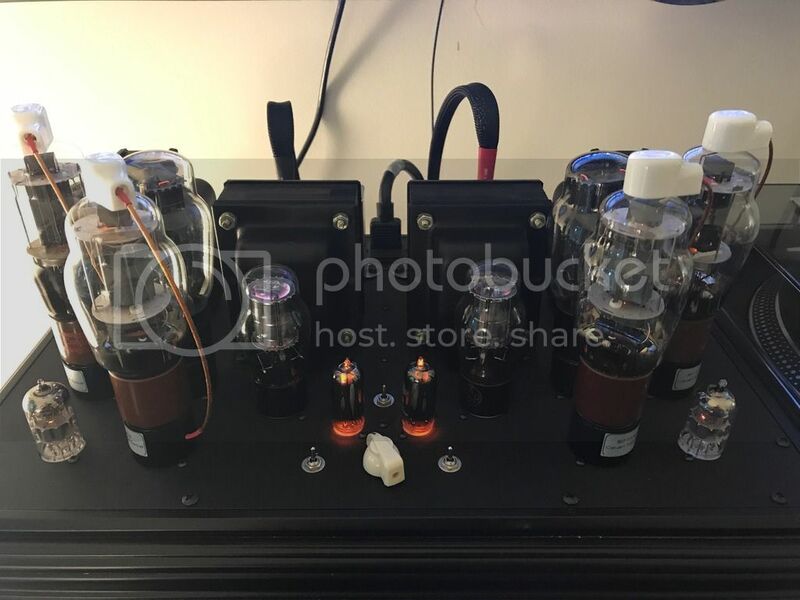 As I understand and hear it, OB3s will notch the power of the power tubes back a little, opening the sound and reducing bass intensity...really it will calm all the intensity...relaxing the overall density and push a little, giving more space across the spectrum. A good first step. I have never totally liked OA3s here, preferring OB3s. Interesting the white noise, not hum...For inputs, if you don't hear any other problems, and like the sound, it may be good to see how far OB3s take you toward your ultimate sound before deciding on an input. Then, if you would like to take the opening and tightening further, a 7DJ8/PCC88 type would likely tighten bass some, and increase space, sense of articulation, and textures. They are all different though, as are all the 6922 types, and why I would not be inclined to recommend a specific one until you heard the OB3 change. Another shift that would move this way in different sonic way is a nice GZ32 to replace the GZ34 Sovteks. Sovteks are pretty nice reproductions, but not in the same league as the much more expensive Mullard types they copy. Most Mullard/Phillips made GZ32s are in the same musical quality arena. Similar to OB3s, the slightly less powerful rectifier would open the sound of the whole...calming density enough to open the sound and tighten bass, and similar to the right 7DJ8, more texture as well. Both the OB3 and GZ32 could also be taken a step further with OC3, and GZ30s. where does one find an OB 3 tube? I have bought several pairs from ebay. I just used this search phrase: "OB3 pair 0B3" and several pairs of Sylvania appeared available at cheap prices. I don't have any pairs to spare right now or I'd send you some. I'm not sure that the noise will be any different with OB3s but the bass presentation will be, it will be a bit lighter, tighter, quicker. I think the noise you are hearing is probably normal. I hear a little if I put my ear against the speaker. That doesn't at all interfere with me being head over heels in love with the sound I'm getting. right on. thanks for the offer, Lon. i'll look around. what is the OB 3 exactly? 0B3 is also known as a VR90, and like the 0A3 it is a voltage regulator tube and will regulate the voltage for the output tubes. Its effect on the tubes is to make them deliver sound with less bass impact compared to the 0A3 as Will mentions and as a result there seems to be less bass weight and drive. It may well give just the effect you wish if you are happy with your input tubes currently. Lon! We think alike. i bought some 0B3s from tubedepot and some OD3s. Also bought some input tubes! now, hopefully i'll be good for a while. did you ever send off those tubes you'd planned for me to demo? Yes, I did. . . and they were returned to me. Looking at their history it never left my county. My post office here is weird. I'm going to resend, just holding off looking to see if there were others I might add to the package, I'm missing a box of tubes. . . if I can find it I'll probably add and resend, if not I'll just resend. right on, lon. no biggie. where are you located? Out in the country near Cleveland, Ohio. I live in a township called Munson that has no post office, so my postal address is the county seat of Chardon, and I think we are step-children as far as the post office goes. They sent back a package of discs from Spain last month. . . they never left me a single notice and claimed they left three, and they never made an attempt to get a signature and I'm home at mail delivery time 95 percent of the time. Oh well. Ha! i live in rural WI. I know your struggle! second round of tubes came today: jj e88 cc's, raytheon ob3's, and rca 0d3's. still trying to tame bass and get rid of this quiet white noise. we shall see. first impression with the 0b3's installed: the bass is generally less boomy. everything else sounds good. with the new input tubes i am hearing less of the white noise i was hearing. perhaps this is what is often referred to as the "noise floor"? I ran some OB3's and the sound was milder and less forward. When I replaced the OA3's the volume increased slightly and the sound was more forward. White noise is probably due to inputs. JJ E88CC sound good but quality control at JJ in general is not good. You need spares because you could experience sudden tube death. the higher noise inputs were the tubes that came stock in the torii. they seem to be etched in russian, maybe? i'm really happy with the lower noise floor and dynamics of the jj teslas, but i agree they had a bit too much gain. looking for something maybe more neutral. i'm also interested in widening my sound stage. thanks guys! In my experience, if sound stage is decent in a setup, it can increase with more clarity and spaciousness, also contributing to solving masking as much as possible. As you have probably explored, this can be adjusted with many ways in the room, but simple speaker placement can do a lot. To find the placement for the least offensive tonal buildup and frequency attenuation patterns can be pretty amazing, and where the best placement is can change with tube changes. Ultimately, by reducing signal push, like with the OB3 replacing an OA3, offensive frequency imbalances become less focused and powerful. And speaker placement/room treatments, help to solve overlapping and frequency canceling sound waves...room-wide, and at the listening seat. Together with tube adjustments, definition and space can be improved, in part due to better definition, to solving masking, and part due to less conflicting reflection patterns that confuse the ear/mind. Less power in the signal from tubes reduces masking/density/thickness and increases definition, and speaker placement can help in the same areas...so they can go hand in hand. More revealing sound from tubes makes speaker placement more audible, so changing tubes might allow new speaker placement information. And spaciousness and definition with room/speaker changes, and with tubes (also power, cables, vibration solutions, etc) can really improve the soundstage. The right distance from the wall to solve too much bass in the balance and associated, muddled low mids, can be easier to find (and change) with more open clarity from tubes. Speaker width, and subtle (or not-so subtle) toe changes can be refined being better heard. It sounds like the OB3/JJ E88CC combo is less boomy, but perhaps similarly forward as when you had OA3s and 6N23P (pretty likely the Russian tubes you had)??? The OB3 worked across the spectrum, reducing "forwardness" bass included...it reduces the push and power a bit. So if the sound with this combo is similarly pushy as with the original tubes, but less boomy, the JJ inputs may be powering up at least the mids compared to the 6N23P, countering part of the OB3 change??? Reducing the push with regulators naturally tones down and cleans up the whole signal a bit. Bass build up being a challenge in most rooms, and excess bass causing thickness from the lowest bass to the mids, over-saturated, too big bass, sounds less dynamic, more muddy/boomy. By calming down the whole of the signal density and push, bass over saturation and masking is generally reduced, and the system/room can become more dynamic with better bass definition, sounding like "better" bass. By reducing the bass, it can sound bigger. Since solving low end masking can be a big problem for soundstage, and the Torii can be powerful at it given challenging situations, I can't emphasize it enough. Since you had boom, you likely had low end masking leaking into the mids and blurring definition and space. Question becomes, what happens if you go further with opening the sound. A good test tube-wise, would be to stick in your new OD3s for a while. They will take the signal density a few notches less pushy, and more open/spacious than the OB3. I would recommend this to help identify the parameters of your overall sound in your room, and your sound stage. If the OD3 sounds "right" to you with your present tubes, or too lean, this would tell a lot in terms of further recommendations. Thank you very much will for that fantastic explanation and response. i'm going to drop those 0d3's in a few minutes. will report back. Here is a crummy shot of my listening space. Listening space is about 15'-18' away. My Torii with the new 807's installed. I like the NOS look of the brown based 807 tubes and the diabolical looking adapters with the white caps and wires. They are complemented by Tesla PCC88 inputs; Mullard 75C1 regulators, and the violet glow of 1940's RCA OB3's, with RCA 5Z3s in their adapters; this way they stand equally high with the 807s. They look very cool, how do they sound? I bought a quad of 1940's Canadian Westinghouse 807's as well as a pair of 1961 Russian equivalents with brown bases. I'm using a Russian and a Westinghouse on each side. They sound nice, as Will has previously stated with the NOS sound and micro detail. I am experiencing a bit more hum from the right side than I am accustomed to. I hear hum coming from the amp and from the right speaker. The left side is normal. The amp has always been quiet with the KT66 and the 6L6 in place. I'm going to swap out some of the tubes to isolate the problem tube(s). It could be a rectifier that is going bad. Although these military RCA 5Z3's seem pretty rugged and serviceable. I hope that the problem is not one of the adapters. Seems that the hum was being caused by a renegade rectifier. I never got clear on this, but quite a while ago I put in some later RCA 807s just to check them out, and got a noticeable hum. The GZ32 rectifiers I was using were fine with my standard quad of 807s, so a attributed it to one of the newer 807s, but did not struggle with narrowing it down at the time. Some time later, I put the same (noisy) 807s in, now with a different pair of rectifiers (Fivre 5R4GY), and all was quiet for my MKIV, well as quiet as is usual, which is not totally quiet. Got me...Now with the same old GZ32 in and my usual quad...quiet. I also bought some spare adapters not long after falling for the 807s...and some time later, sure enough, one of the cheap adapters I had been using for quite a while started to short in the base. I could not get into it to fix it, so lost one. just popped in a pair of mullard pcc88s. so far i notice a major increase in gain. it's all over the place but the sound just keeps improving. do you guys have any thoughts on these tubes working together? If you went from 6N1P your gain increase makes sense. They are quieter tubes before distortion than 6922, 6DJ8, 7DJ8 types. Are your KT77 JJ or Gold Lion...difference in sound in a similar vein there. But generally, this set likely has quite good dynamics, tight bass, with open, articulate, and textured mids...very good speed, space, and micro detail. If after settling in, you like your sound in general and would like to take it further, your weakest link is likely your Sovteks. Better rectifiers with similar, but more refined character will likely notch the whole up. Sovtek GZ34 are Mullard copies. Generally, though varied depending on vintage and construction, Mullard GZ34 are considered by most the best of the type and very, very good. So if you like your tonal balance, speed, space, density and micro information, etc, NOS Mullard, or other Phillips made GZ34s would take it to new levels. They can come with many different labels, different European makes, and even American seeming GE or Hammond, those companies contracting tubes from Phillips. If your sound would improve from a bit less density, thickness and and bass, while keeping GZ qualities of fast, open, articulate, textured, spacious, with tight bass, NOS Phillips made GZ32 would calm the density and thickness down further, similarly to OB3 replacing OA3. These too are variable by vintage and construction, but this generally describes the differences between GZ34 and GZ32 made by Phillips companies. After everything is burned in and the amp adjusted to get the most from this tube set, if you want something specific to happen, just ask. Yes I liked those JJs for the most part when I was testing them. Nice powerful tube in the Torii. I get the buying part. Luckily, my love of tubes solved my issues with buying new ones to check out. Not in a hurry, good prices, buying now and then encouraged the exploration. After years, there are plenty of all types to mix and match in different ways into all kinds of combinations of beauty! I love to do that every so often...sometimes pretty often, refining the tube set. interesting development. i decided to pop the gold lion kt66s in with the mullard NOS pcc88 and i really dig what i'm hearing. the dynamics seem more relaxed and less punchy. saxophones are less grating and the midrange is pretty liquid. the bass is just on the tight end of muddy. overall i like it. Sounds like nice tuning! This is why I love having a number of tube choices, to tune or fine-tune a set. With PCC88s, KT77, and GZ34, (especially with the lower key/more open OB3) each of those can contribute of open clarity, dynamics and tight bass. If too much, rounding this set down with the warmer/bigger/thicker Gold Lion KT66 sounds like great solution. Great tube in the right company. I am always amazed. I seem to need a pretty narrow window of space, body, extension, detail complexity, balance, etc. But each time I change up a tube set, finding that place that brings out the best of all the tubes used...the combination makes a sound like no other really. Yet it fits my relatively narrow window. Once fine-tuned, the combination with different tube influences, I hear/feel the musical beauty in new ways, with new excitement. Confessions of a inveterate tube roller? Will, I confess I'm becoming more of a tube roller than I have been for a while. The Taboo Mk III started it up for me again as it was a new experience and it was so easy to hear instantaneous changes via headphones. And then I stretched the habit over to the Torii Mk III. Initially I became worried that my Amperex 7308s I've used a few years might be getting long in the tooth (a suspicion that doesn't seem to be verified, in comparison to NOS unused tubes I've been rolling these 7308s are still strong and hearty). I noticed that certain "offbeat" types from quality makers were considerably cheaper than the more recognized types and so tried a few out. I also decided to start with fresh 0A3 and 0A2 tubes and got a NOS pair of RCA OA3 and a fresh set of RCA 0A2, as well as a Tesla tube that is similar to the 0A2, the 11TA31. I bought two pair of Mazda PCC189 tubes, a pair of Mullard ECC189 and a pair of Amperex ECC189. Each of these sound quite good in a complement with either of the three types of output tubes I seem to rotate, the 0A3s and either the 0A2 or 11TA31. So far my favorite are the Amperex ECC189 with the 11TA31 and the Mullard with the RCA 0A3. The Mazda are quite good though on some material the high end is just a bit uncontrolled, some splashiness on occasion. They may need some more break in. My tube-rolling is ramping up. . . though I'm nowhere near the "driving me crazy" stage I have reached in the past. . . still I'm ready to turn my attention elsewhere, to a second system where I am trying to set up a headphone/small bookcase system and rotating the amps and preamps I have in storage. . . .
And later this week new operating software for the DirectStream DAC will be on hand and more changes. Sigh. I suspect they will be good changes though. . . .
ok - so tubedepot dot com is having a 15% off sale today and that makes me feel like replacing my kt66's. i'm currently running gold lions but they are a few years old. any suggestions? Hey Lon. Thanks for sharing your latest explorations. I never got around to trying PCC189. I always bogged down, not finding conclusive verification that they are functionally like PCC88s...some say yes, some no. Same with ECC189...just have not gone there to find out if they would work in our amps. So thanks for verifying this! As you know, though I really like many 6922 types, especially in the power position on the CSP3, and occasionally in the Torii MKIV, I tend to prefer PCC88 and ECC88 over E88CC/7308/6922 in my Toriis. So this is great information. Also the Tesla OA2 sounds interesting. Though I am pretty hooked on 751Cs, I do like the Haltron OA2 I have. Not generally falling for OB2 compared to OC2/751C, it surprised me that I liked liked the the even lower key OA2s. But they have a sweet tonal balance with excellent openness, warmth, and fine-detail. The less-powerful, softer presentation balances nicely for me, though the way everything else is set up, I do miss some of the power, punch, body and bass the 75C1s offer. On the other hand, though the less forceful OA2 loses body and bass, it gains in space, lucidity, and more space for very fine detail information. And with the OA2 I can really push the CSP3 in the mix, which is interesting. Still not sure about these, but compelling... I need to explore these more and tune to them. Balancing them with OA3 over OB3 sounds interesting. Using the OA2 to power down the inputs, and OA3 to power up the power tubes. The sound balancing options with Toriis are amazing! The Mazda PCC189 I saw on ebay looked to be English/BVA made A-frames. I wonder if this is what you got. The A-frame ECC88s I have are particularly open/clear for the type, usually with good texture also...but a different sound that seems associated with the A-frames. Seems they can tend a little upper-mid-to-top oriented, and sometimes with a little more rigidity to the clarity. But with the right company, pretty great. Not sure this is an A-frame trait across tube types, but maybe. I agree, I would try and get the Mazdas burned in before drawing conclusions, maybe solving the wild top forays, but also the A-frame effect may be at play to some degree. It sounds like the Gold Lions are pretty good with your other tubes. That is a powerful tube, very influential, but also pretty variable depending upon the company it is with. They are a "big" sounding tube to me, and can be pretty fast and natural sounding, or they can be pretty syrupy and a little slowish depending on the rest of the tubes. If you want the general feel of the Gold Lion, but want to shift more open, less "warm" and "syrupy," the other old school KT66 copy (the tubedepot calls it Sino KT66) would likely open things up. It looks to me like this is the same base tube TAD and Valve Art sell. Their selection processes may matter, but not having compared I can't comment on that. I have Valve Arts that look like the same tube as these "Sino" KT66, and they have a biggish KT66 sound, but less warm/thick than Gold Lion...more open/clear, and faster feeling. This is not to say I think it is a better tube...just different. If the Gold Lions seem "right" in these areas, it is likely more right than the Sino with the other tubes you are using. Will, these Mazda seem to have more of a frame grid construction (?) than an A frame to me. (I added a pic). An odd tube, may well not even be NOS, may be something else (the nomenclature "Made in England" is a bit unusual for NOS)--they also are marked BVA. They do have a lean yet textured sound and it's nice with the Tesla which have a rounder signature. Even though I did put another few days on them that uncontrolled top end hasn't seemed to change its behavior. In a way it is more accurate than I had first given it credit for as the splashiness occurs most in recordings that have a hot top end. I think with your tube stash you would find any of these PCC189 and ECC189 to work for you, the prices have certainly been right. Surprisingly the new Huron firmware has prompted me to do more tube-rolling; there seems a lowered noise floor and a heightened instrumental shape and a burst of new clarity. From my recent tube choices I was surprised that one that seemed a bit too "smoothing" to me before hand has become the best choice today: RCAs that the seller is calling Mullard made. With the Tesla regulators there is a nice body and dynamic nature to the sound and no frequencies seem to be favored or misrepresented. This pair was particularly cheap. . . I'll be on the lookout for another in this price range. Lon, Will - I'm really enjoying this banter. Will - i agree about the gold lions. currently in this configuration, the GLs are very gooey and almost flabby, but they have great openness in sound stage. I'll try those 751C regulators again soon, I just have been seduced by the 0A3/0A2 combo regulating the tubes and with fresh tubes of both types on hand I find it hard to move away from them. The Tesla surprise me. They seem to add a bit of dynamic range to the input tubes and give a bit of body to a dry top end. A fun discovery, and I'm glad I got four of them at once because I know I'll want a back up pair in time. Re: Gold Lion: I believe Will is right that the TAD are the basic "Sino" (Shuguang I think is the factory) KT66 that Valve Art also uses. TAD may have made a few changes on the standard, they have done that on some tubes in their EL84 range, but they don't appear to be very different. I think they carefully select quality tubes--on top of that I bought a quad cryo'd by Ron at Cryoset.com and they have lasted surprisingly long for me, over two years. I find that I can build different tube complements around them and they respond well. Gold Lion were my second favorite of those that I tried and Tung-Sol my least favorite. Pretty soon I need to buy a new quad and may go with Gold Lion. I had a similar experience to Will's with them, and enjoyed the variety I could get from them. Currently I'm mostly using JJ 6CA7, and I'm finally encountering the problems others have with them which is a shame as I think these may be my favorite tubes with the Torii Mk III. So I would suggest either getting another quad of Gold Lions or trying out the TAD--I certainly have had a very positive experience with the TAD. I see, the Mazdas look like they have O getters. Sorry about my confusion. I think the "made wherever" thing may have been pretty common for a while for tubes contracted from other makers. I have several pair of old RCA labelled ECC88s, one saying made in Germany, and they do look like early 60's Siemens tubes...and two "made in Great Britain" with construction that does look like they could be Mullard. I also have some GE labelled 6922 gold pins, one says "made in Holland" and one "made in England." They have identical construction, using the classic Mullard parasol getters... so I am guessing the England label is right, and Holland not! I wonder if the "buyer" company labelled these, and someone screwed up on a batch. Hard to say on the Mazdas, but I suppose it is possible they were made by BVA. I don't have any Teslas 11TA31 (I ordered a pair), but I hear excellent dynamics the Hytron OA2...they seem fast. I think the main difference with the 75C1 is probably that they power up the input more. This balances more toward bass, reads with more body, and gives a bigger/rounder overall sound push to the dynamics. I look forward to trying these tubes. It is all fun! Oddly with the 0A3s I get a tighter, less bass-centric sound with the 75C1, at least with the other tubes I was using at the time. The RCA 0A2s give me a dynamic presentation too, but with a dryer, more defined signature compared to the Tesla rounder signature. Time for me to try the 75C1 again, probably later this week. I am really enjoying the Tesla a lot and I think you will enjoy playing with them. Those Mazda puzzle me. . . I read that some suppliers think that "Made in England" is a sign of fakes, as predominantly tubes were labeled "Made in Great Britain." Still these don't look Russian or Chinese and they do have the BVA designation. Anyway time for me to try them out again soon as well. It is fun to tube roll but I had a lot of variables going this week and it got daunting. Now that the firmware "Huron" is installed and I decided that the "new" PS Audio HDMI cable is inferior to the "old" PS Audio HDMI cable and returned that to service the variables are lessened. The "Huron" firmware has made an impact and so far the RCA/Mullards have taken the lead in the best fit category, which they did not with the previous firmware. Rolling firmware in this DAC is a lot like rolling tubes! what is the problem the you're noticing with those KT77s? I don't have KT77s, haven't used them yet. I'm was talking about the JJ 6CA7s I've been using. I had one of a quad fail on me after only about five months. This current quad I have one tube that doesn't come into full play til it warms up and literally "pops" on. I probably shouldn't use it but I've only had the quad for four months or so and the sounds is fantastic. These really are the best output tubes I've used in the Torii Mk III. Great bass and sweet treble and wide-open mid-range. Dynamic too. So. . . I keep hoping that I can get a year out of this pair and I have another quad don the shelf. When I first started using these (and Steve was shipping them with amps) I didn't have these problems. . . .
'S alright. I get confused too. I realize I'm the lone sloan posting about the Mk III in this Mk IV thread. . . just following a conversation and forgot for a while that I was on a Mk IV thread! I'm sure there are some differences that are significant in tube rolling, probably mostly because of the differences in tone controls. But to summarize my position I'm finding that the Mullard input and Tesla voltage regulation tubes are the combo that are going to get the most coupling in this Mk III. With this combo the "High Regulation" mode on my P10 is very musical and fits much of the material I listen to. "Less Distortion" mode is also very good especially for very transparent recordings. I am really enjoying the sound. After a spell of enchantment with KT66 tubes I'm back to using JJ 6CA7 for the nonce because they just have something no other output tube I've used has, a tonal balance that allows me to be very flexible with other elements of the complement. The reliability though is a worry. Great thread. My tube rolling obsession seems to be in full swing these days and I have been doing some research on some output tubes that I do not hear a lot about with the Torii iv. I got a NOS quad set of Tung-Sol 6AR6 for about $60 and bought the chinese made adapters for about the same price as the tubes. I asked Steve if these tubes would be ok in the Torii and he gave his blessing. I am going to give these a listen tomorrow and will report back. I don't have super high expectations but tube rolling is fun in and of itself. I just received a quad of strong RCA 6L6GB black plates (similiar to the famed 6L6GC). The GB has a few watts less output but I thought they would be worth a try at less than half the price of the GCs. I listened to these tonight for the first time and they sound very good and very different than other 6L6s I have. I paid about $150 for the quad. mish-mash labled Bogen, Baldwin and GE and sound phenomenal. I paid $140 for these and they are head and shoulders above anything else I have at the moment. I am going to keep an eye out for another quad to have as back ups. I have a quad of NOS RCA 6BG6G (very close to an 807) that I am excited to hear but I am waiting on the adapters from...you guessed it, China. I also have some russian 807s on the way as well. I also have some RFT el34s that are ok imho but with my setup 6L6s seem to sound the best by far in my set up. I also have some new stock Gold Lion KT77s that I like better than the RFTs. I am going to spend some coin to get some Mullards one day as well as some new stock 350b. For input tubes I have tried a bunch and nothing seems to touch my US Amperex PQs. For regulation tubes I have some Hydrotons in right now and have a bunch of others. I have some old fat bottle Philco 5U4 that look really cool but right now I have some RCA 5Y3 in. Thanks to everyone for all the great information. I have never seen the OE3, but searching it, it looks like a different base than the Torii uses, the OE3 using a "lock-in, 3 pin" base, and larger Torii VR has a standard 8 pin socket. So even if they worked electronically, it looks to me like they would not fit. The OB3 coming will let you hear if you would like to go further in reducing the intensity of the power tubes by trying OC3 or OD3s. I have tried them all and like them all, but in my setting, always go back to OB3s. This of course is system/room, tube set, and taste dependent. Many stay with OA3s for the most power to the power tubes; some end up with OD3s to open things and reduce bass and intensity the most; and many end up in between like me. For me, OA3s are a little intense in density and push, so I lean it down a touch with OB3s. Also, as you explore, as your Brimars sound different than the stock tubes (often Russian), within each type (A,B,C,D), most I have tried sound a bit different, another way to fine tune if you want. Then there are changing the little VR, stock OC2, with different brands, or types, like 75C1/CV4080s (close to OC2 electronically); or trying OB2 and OA2 (or 11TA31) to tone it back some. With similar effects as going from OA3 to OB3/OC3/OD3 for power VRs, due to their influence on the input tubes, these little VRs change the personality of the sound in similar ways, but a little differently. thanks Will - very helpful. I'll hear soon what 0B3s offer, they should arrive any day. The Brimar 0A3As bring a noticeable improvement in clarity over the RCA, Sylvania and National 0A3's I've been rolling. The rest of my current setup includes Valvo 75C1s, Telefunken PCC88s, Sophia Electric Aqua 274Bs and Gold Lion KT77s. NO COMPLAINTS! Glad that helps. Sounds like a nice tube set! I really like 75C1s and have some Amperex labelled OA3As that I had similar impressions of as you with your Brimars. I have yet to try the Sophias. I bet they are nice. I will be interested to hear how you find the OB3s. Fun! My 0B3s came the other day and I had the chance to roll them last night. Very cool sound. My initial impression is smoother with more ambient detail. A more ethereal vibe. I listen primarily to jazz, small group material. Some Jakob Bro and Arve Henriksen sounded dreamier if a bit less intense. These sound like really good observations to me! For denser recordings especially, I really like the traits you noticed. When aspects of what can contribute to "density" carry into thickness and forcefulness, I don't like it. The OB3 has always helped resolve that here. I have some Winged 'C' 6L6s coming today and while I hadn't planned to pick up any power tubes right now I stumbled on a review that changed my mind. I've been loving the Gold Lion KT77s but I listen to so much jazz guitar the Winged 'C's were too hard to ignore. Much of my tube rolling comes from curiosity rather than dissatisfaction. I love all of the nuances of sound that the MKIV brings to my life. I just ordered a quad of EH 6AC7's for my MKIV. Thanks Lon for posting your experiences even if they relate to your MKIII. After getting to a comfortable place with my setup I've started to revisit the power tubes. I bought my amp used and it came with a nice compliment of tubes to get started. For power tubes I've rolled: Tung Sol KT66, GL KT66 & KT77, Svetlana EL34, Mullard EL34, 6L6 =C=, Reflector 6L6 and lastly the EH6CA7s. Too soon to tell but I may be in agreement with Lon - there is a rightness about the 6CA7s across the spectrum that grabs my attention. I had the Tung Sol KT66s in just prior and was loving the chime I was hearing but everything seems to fall into place with these. Looking forward to the rest of the week to listen to some more music. There aren't that many 6CA7s out there which is a good thing as far as limiting the $ spent checking out the landscape. Anyone tried the Psvanes? Anyone tried a 6bg6 in their Torii?